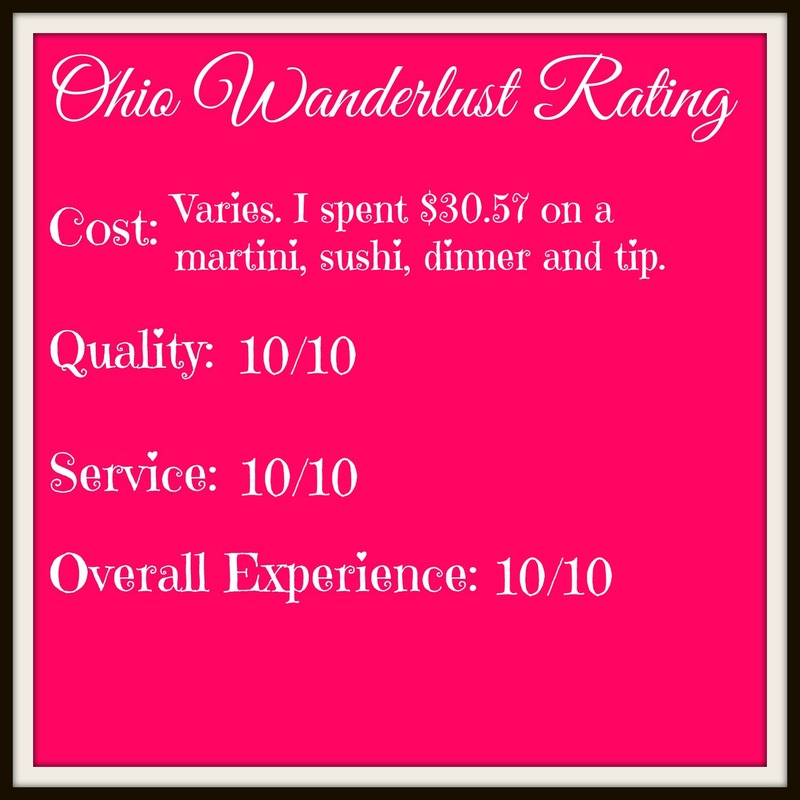 Cilanto Thai & Sushi in Akron is a great dinner location for just about any occasion. I've been there on a date night or girls night and we've hosted a large group of friends there for a birthday party. One thing that is for certain is that on the weekend you absolutely must make a reservation. I visited with a group of friends on a Friday and the restaurant was packed, without a reservation we would have been waiting quite a while. Our server was incredibly pleasant and due to the new addition of servers carrying tablets instead of pads of paper as soon as we placed our drink order the order was already sent to the bar. This expedited level of order delivery was wonderful, especially for bar drinks. No longer does a server need to find a POS and wait around while other servers place their order. The Cilantro-tini made with Ty Ku Liqueur, Absolut Citron Vodka, Lime Juice and Lemon Soda. This was the drink I ordered and I thought that it was a nice refreshing martini. The soda kept it light, but the alcohol was certainly apparent. The Naked Mango Martini: Smirnoff Raspberry Vodka, X Rated Liqueur, Mango Nectar and Lemon Lime Soda. Several of us started out with sushi, we were right next to the sushi bar so it was difficult not to be tempted. I ordered the avocado sushi from the ala carte menu. A friend ordered the Hot and Sour Mushroom Soup for her entree, described by the menu as "Thai classic "Tom Yum" soup with mushrooms, tomato, onions, lemon grass and galanga, in a light vegetable broth, flavored with lime juice." I ordered the Red Curry (Gang Dang) described as "Red Curry cooked with coconut milk, bamboo, eggplant, red & green peppers, and Thai basil." I added tofu to mine, if you don't like tofu you could add additional vegetables, chicken, pork, shrimp, beef, or seafood. Another friend ordered the Green Curry (Gang Keo Wan). Both were served with rice. For all entrees you can choose the spice level on a scale from 2-5. I played it safe and stayed with 2, but I've chosen 3 before. I enjoy the Red Curry, I think it has a nice mix of vegetables in it and the curry sauce is incredibly delicious. The Sushi Bar. Those boats are sushi holders which can be ordered loaded with sushi. Cilantro serves a Boat for One, a Boat for Two, and a Boat for Three which include varied and increasing amounts of sushi. There is also the Thaitanic which includes "Twenty four pieces of assorted sushi, twenty four pieces of assorted sashimi along with a California roll, tuna roll, JB roll and a shrimp tempura roll" all for $89.95. 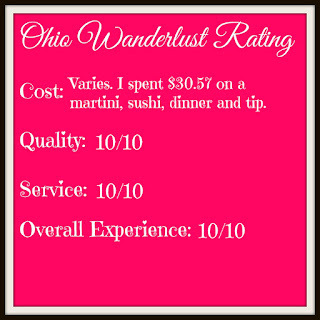 Cilantro was also just voted Best Thai of 2015 by the Akron-Canton Hot List -- this is a restaurant that you certainly want to check out next time you're in the Akron area, whether you're into sushi or curry or something else, Cilantro's menu is extensive and has something for everyone. As a vegetarian, I've always been really happy with their selections, because there are quite a few meatless options on the menu and tofu can be added to a lot of the selections. One downside to Cilantro, which is common of all Akron restaurants, is that there's no parking. There is plenty of street parking on both sides of Main Street, I was able to snag a spot there. The spaces are pull-in only, but free after 6:00 p.m. and on weekends. There is also a parking garage down the street behind Barley House, also free after 6:00 p.m. and on weekends. If you're looking for real estate company, don't hesitate to contact FazWaz. Our services include property consulting, relocation services along with property management and property promotion.